Want to be a player host? Find out more here! Interested in becoming a Voyagers host family? Get more information and fill out our questionnaire HERE. 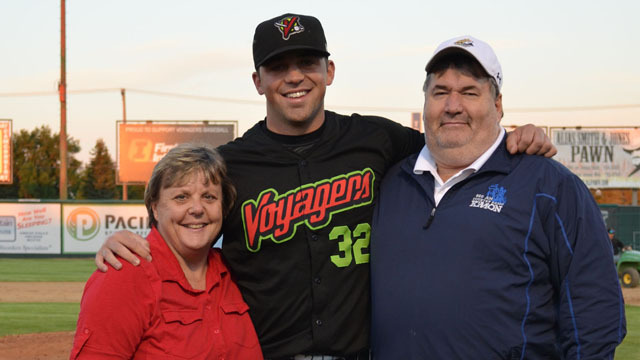 Host families are a vital support system for minor league baseball players and coaches. They provide an affordable place to stay, home-cooked meals, and local experiences that would be hard to find anywhere else. Without them, working and playing in the minors would be a much harder ballgame. The most rewarding part is that, by the end of the season, our host families are usually as grateful for their players as their players are for them. Over the next few months, the Voyagers are going to highlight some of our amazing Host Families to say thank you for their dedication and to promote the program to families and individuals who may be interested in participating themselves. This month, we're highlighting Host Parents Sue and Jim Sargent. They have hosted for the Voyagers for several seasons and have been known to take their Voyagers on some of the most exciting trips Montana has to offer. Q: Why did you originally decide to host players? A: When we moved to Great Falls, it was something we knew we wanted to be involved with because hosting professional athletes is a rare/unique opportunity. Q: What have you personally gotten out of hosting players and what does it mean to you? A: We have friendships that will last a lifetime! Our players, their families and friends have become, and will always remain, part of our lives. We also have had new experiences provided to us by what the players bring in terms of their backgrounds/experiences. It is very rewarding to be able to provide the players with first time experiences. Not only is Montana unique to them, but also, the opportunities we provide for them. First time experiences for so many of them created memories that will never be forgotten. We call it Forced Family Fun: fishing, floating the Missouri River, Glacier Park, seeing/hiking mountains, county fairs/farm animals, experiencing harvest and horses, and becoming part of the Montana State Bobcats vs their [own] big-time colleges, just to name a few. Q: What's one of the nicest things one of your former players has ever done for you? A: There are so many things that we have been blessed with. First and foremost, their respect and gratitude for everything. It is amazing how quickly the bond forms and how much everything we do for them is genuinely appreciated. Hugs… lots of hugs, and that is something we can never get enough of! There is not a holiday that we do not receive messages from them. - All-expense paid trip to experience where the player grew up, his family, friends and lifestyle. A once in lifetime opportunity for us! - Beautiful gift baskets from their home states: food, artwork, college gear, flowers, etc. arriving in the mail long after they have left our home. - At the wedding of one player, we were seated with his family. What an honor and privilege that on his best day, we were thought that highly of. - The continual contact with each player and many of their family members remains the nicest compliment of all. Thank goodness for social media! - Each year, it is special that former players suggest to new players that they would be a match for us. What an honor to have such high recommendations! Q: What keeps you coming back as a Voyagers Host Family? A: Meeting new young men and their families [each season] keeps us passionate about being part of this host family opportunity and we embrace that! We hear often from parents [who] are so full of gratitude knowing that their son has constant support in a home away from home. These young men inspire us! Their passion for the game, their drive to be all they can become, and knowing that for the briefest of time, we are part of that supporting role. The funny antics that occur almost on a daily basis provide memories that will always be part of our hearts… leader board scoring, washing machines, car windows and crock pots are just a few of the times that will never be forgotten! Q: What piece of advice do you have for others who are considering participating in the Voyagers Host Family Program? A: Do it... Embrace every moment with these young men. They quickly become part of your family. Respect is a two-way street… Let them be young, let them experience Montana, and welcome them into your family like they have always been a part of it. You will make long lasting memories. Thank you, Jim and Sue, for everything you do for the Voyagers year after year. 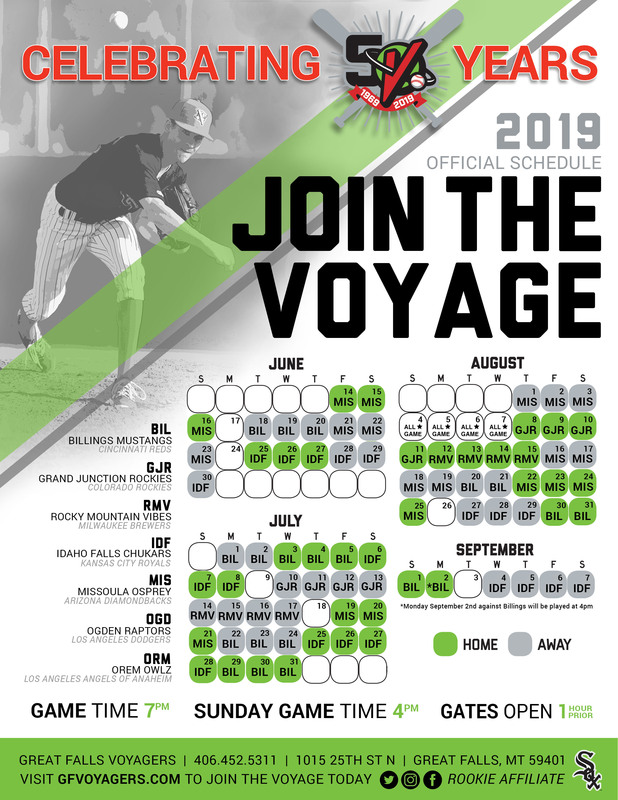 We appreciate your support of the Voyagers and your passion for the game!